A good week with 59 points scored and a rise in the ranking to 1174 overall rank. Points all round from my defenders and midfielders, with only the forwards somewhat disappointing. 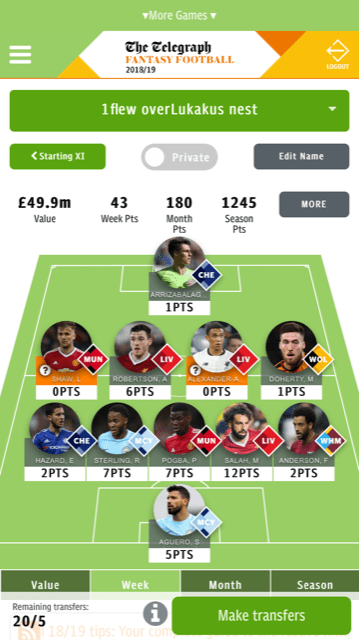 I am happy with the team in general although as I write I’m considering taking out Richarlison who has gone off the boil. The trouble with a 5-3-2 formation is the lack of flexibility and so his replacement would need to be another midfielder and I’m not over enamoured with the choice of replacements. I’ll probably stick with Richarlison a bit longer as his fixtures remain decent. Jesus should start at the weekend so I’m happy with him short term, but an upgrade to Aguero is on the cards, possible even for the following midweek fixtures. Other than that its a case of sitting on hands again and waiting for double gameweeks, rearranged fixtures and the like and seeing what possibilities they bring. 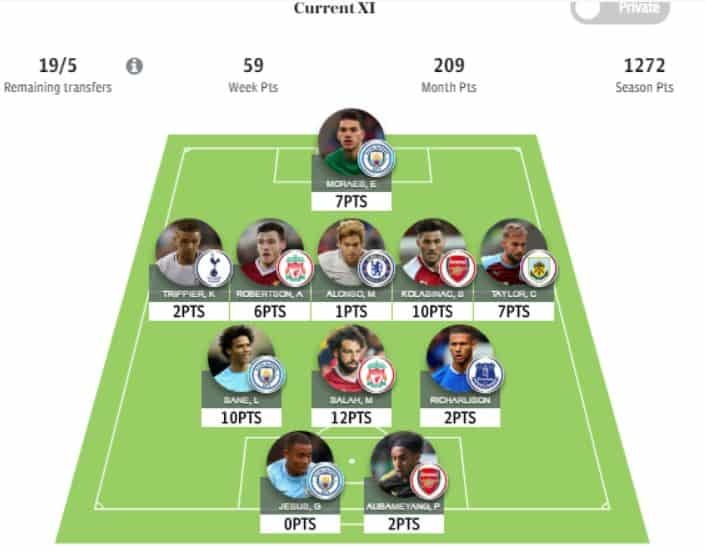 A good push last week with 67 points and a rank rise over 1000 places. The no Liverpool clean sheet plus my three subs helped to this. I did my three planned moves of Kane to Jimenez, Salah to Aubameyang and Paterson to Alli. Jimenez had a great start with 8 points, Aubameyang blanked in his usual fashion with big missed chances, and Alli also scored however got injured towards the end until at least March, which is an unfortunate use of a transfer. I have two admit to being a little disappointed with the weeks score. I felt like I had most of the major bases covered, yet my team still contrived to drop around 500 places. This certainly wasn’t helped by facing the weekends fixtures without two of my defenders. This led to a distinct lack of clean sheets and disappointing performances; The one exception being Robertson, who managed six points despite conceding three goals. I am much happier having Salah on board, and more to the point, his 12 points. 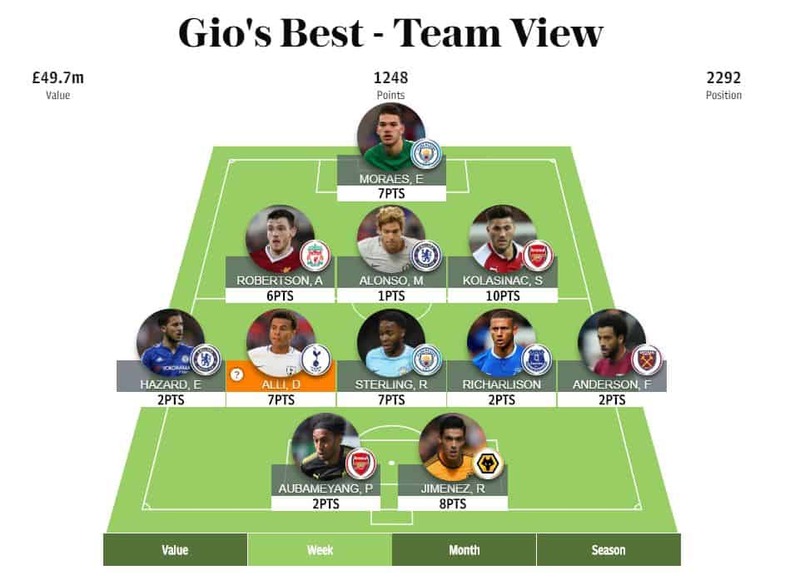 Pogba and Sterling pulled their weight with a goal each, but Master Hazard and Mr Anderson were well and truly unplugged from the fantasy matrix. As I thought he would, Aguero started against Huddersfield, but could only manage one assist. I think it is safe to assume that he won’t be starting the Burton game, so his next outing will either be Burnley in the FA cup, or Newcastle in the Premier League. Both of which give me a warm fuzzy feeling. Could it be time for another Aguero hat-trick? Wouldn’t that be nice? Luckily, I hadn’t got round to deciding who I was going to bring in to replace Trent A A before the news broke that his injury wasn’t as bad as first reported. It was then a simple decision to leave him in, despite missing the weekend fixture against Crystal Palace which turned out not to be a problem anyway. I’m hoping that I will have a full quota of defenders when play resumes. I currently have three players who I am shuffling towards the edge of my fantasy boat where they will be made to walk the plank unless they come up with something soon. Like most owners of Hazard, my patience is wearing thin. However, I won’t be kicking him into the ocean before a meeting with the Bournemouth defence. West Ham visit Wimbledon in the cup, before Wolverhampton in the league. I shall cross my fingers and hope that Anderson features in both games, but if he doesn’t, it’s Liverpool up next, and that could be the end of him in my team. With great regret, the third member of my squad on the possible out list is Doherty. He is cheap, and he has been outstanding value, but unlike the FPL game, it wouldn’t take too much to upgrade him. I am in no great hurry to remove him though. After facing Shrewsbury in the cup, they have a wonderful run of fixtures, this should see him hang around in my side for a while longer. My ideal scenario would be to swap Anderson out for Jiminez in the next week or two. Amazingly, the £3.7m Wolverhampton striker has just one point less than Aguero, and I will be hoping he can cash in on his stupendous run of fixtures.